I was digging around on Golden Blossom Honey for a good salad recipe recently. I was wanting something with lots of veggies and leafy greens, but my tune quickly changed when I found a recipe for Asian Noodle Salad. Pasta is one of my favorite foods, and when I read through the ingredients, a leafy salad just wasn't going to cut it for me anymore. It's still packed full of veggies and the spinach did satisfy my leafy craving, and I got the best of both worlds by adding in noodles too! The raw veggies balance out the texture of the dish perfectly! What's your favorite Asian inspired dish? Mm, peanuts make an Asian salad. Yummy. Have a great 4th of July weekend, Theresa! Happy 4th to you too Robyn! Pasta is my weakness. Next to bread and chocolate, I just can't pass it up! I don't normally do peanuts. They don't agree with me. But in small doses like this, they are fine. Cashews, walnuts and almonds are my nuts of choice. I agree - nom nom nom! 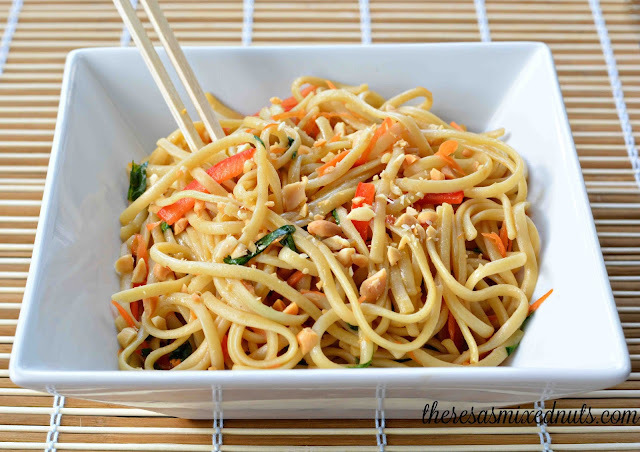 Your Asian Noodle Salad looks delicious! I love brugoghi (not sure if that is the right spelling.) It's either pork or beef / rice and rolled in a red lettuce leaf. At least that is the way my sister-in-law makes it. Yum! That sounds really good, Kristi! Would make a great lunch or dinner! Spinach is nom nom! Though I've only really started liking it these past 3 years. Mm, this sounds really good. I love Asian inspired dishes. This looks sooo good! We love Asian food and my husband makes a good Asian salad. I will have him try your recipe. This does look so good! I make a Pacific Rim Stir Fry that's good. I think it's a good sounding noodle salad. I'd like to give this a try here. I want to make this salad. It looks so good. I really love this one. 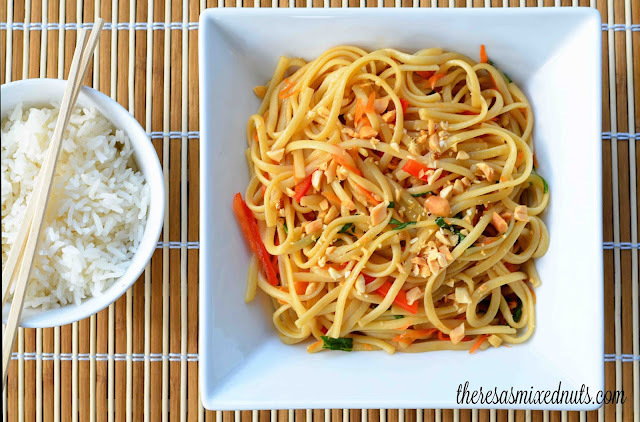 Noodles are my kids favorite food & this noodle salad looks so yummy and delicious. I bet my kids would definitely love this yum recipe. We have been using Golden Blossom Honey for past few years. This Asian Noodle Salad looks so good. I love that it is almost identical to the ones that they make at most Asian restaurants. Aaaw.. My kids' fave.. You should try chicken with golden honey as well :).. Super delicious ..
Actually, I did marinate some chicken and tossed it into the dish after the photos were done. Hubby just can't have a meat free dish.